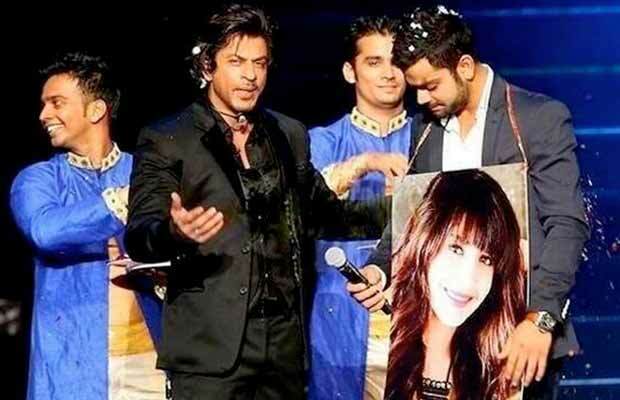 Throwback Video: When Shah Rukh Khan EXPOSED Virat Kohli And Anushka Sharma's Love At IPL Ceremony! Throwback Video: When Shah Rukh Khan EXPOSED Virat Kohli And Anushka Sharma’s Love At IPL Ceremony! Bollywood actress Anushka Sharma‘s wedding with Indian Cricketer Virat Kohli is currently a talk of the town. Media, fans, and even celebrities from Bollywood industry can’t hold the excitement to know about the couple’s wedding in Italy. Sorts of reports about their wedding venue and everything are doing rounds. While there has been no official confirmation from the couple’s end or their family members, we thought of going through a #throwback video of the Virat Kohli. Remember it was Bollywood superstar Shah Rukh Khan who build Anushka and Virat’s love entanglement at Indian Premier League (IPL) in 2014. During the IPL ceremony, SRK held an impromptu ‘swayamvar’ for Kohli. The actor teased Virat with Anushka’s name, leaving him all blushed in red. SRK exposed that Kohli and Anushka are ‘walking’ on the highway of love. That was the first time when Virat Kohli publicly revealed to his relationship with Anushka Sharma. Meanwhile, Jacqueline Fernandez has solved the biggest mystery by accidently confirming Virat and Anushka’s marriage. The actress confirmed the news while talking to media at the recently held, Lux Golden Rose Awards 2017. Read Here To Know More: Watch: Jacqueline Fernandez Accidentally CONFIRMS Virat Kohli And Anushka Sharma’s Marriage! Previous articleBigg Boss 11: Was Proposing Hina Khan On The Show A Publicity Stunt? Boyfriend Rocky Jaiswal Reacts! Next articleLisa Haydon Trolled For Her New Drastic Transformation!